This beautiful street has three story row housing with big bay windows in the front street view. With the architectural interest of crown adornments and barrel tile roofs, you will be proud to have anyone visit you in this neighborhood. 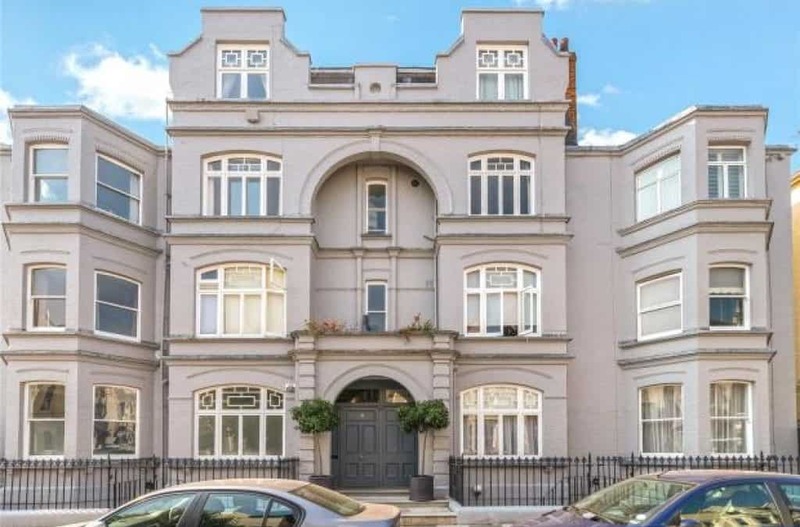 Located just two blocks from the Parsons Green Tube Station, and having two bus stops less than a block away, commuting to wherever you need to get to is easy. Also within walking distance is a modern Yoga workout facility, Gola restaurant is just up the street, as is Amuse Bouche restaurant and Le Pain Quotidien for the best in a café that’s always offering a rustic-chic style. However, if you’d prefer to cook your own meals right in the heart of these places is the Cooperative Food Market. The first thing that catches your eye as you enter the flat is how big and spacious the open floor plan is. The bay windows dominate the room with natural light that carries all through space. Spartan in furnishings there is so much potential to create an atmosphere that is truly your own. To the one side is a beautiful and grand fireplace that has a detailed and architecturally enhanced hearth. The surround on the fireplace is substantial and the mantel is just awaiting your finishing touches. There is a chandelier in the great room that has a medallion plate that dresses the entire space up. Combined with the high ceilings and crown moldings all trimmed in white you’ll feel you’re living in a magazine advertisement. There is a very large window that’s 3 feet high and 4 foot wide that brings the outdoors in behind your dining table that will comfortably seat 8. Through the archway you enter your kitchen with marble granite countertops on each wall you will never run out of space to prepare a feast with ease. The kitchen boasts all the latest in appliances, with an extra large refrigerator and a cooks dream with gas burners in the range. What’s more is that besides the three walls of cabinetry you have a double wide pantry closet, so you will again, never be pressed for space in this Fulham flat rental. This flat boasts three double sized bedrooms, each with a large window as the focal point. Each has a queen-sized bed and the master bedroom, that is a mite larger has an ensuite bath of its own. The third bedroom has a floor to ceiling set of wardrobe built-ins for additional storage and hanging clothes. Complete with marble counters and a double wide and deep sink, you’ll enjoy having a step-down shower that is large enough for two. The other bath is a full sized family bath complete with a sunken tub and glass partition for showering, and a large window with crinkled glass for privacy. With too many features to mention you will want to call your London Relocation agent and have them line a showing up for you sooner than later. There are many more pictures, just click on the kitchen photo to be taken straight to this property’s details page. At just £2,925/month, you will have room to spare in this gorgeous Fulham flat rental.